Heat the oven to 400°F. Unfold the pastry on a baking sheet. Sprinkle the pastry sheet with the almonds and 2 tablespoons sugar to within 1/4-inch of the edge. 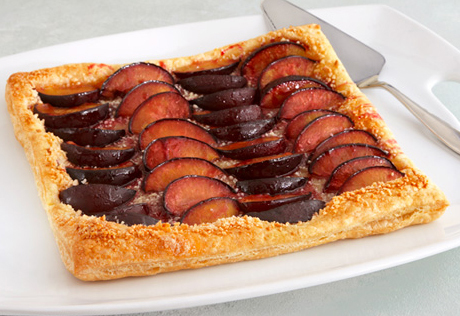 Arrange the plum slices on the pastry sheet, overlapping slightly, if needed. Sprinkle the plums with the remaining sugar. Bake for 20 minutes or until the crust is golden brown. Top each serving with 1/2 cup ice cream, if desired.